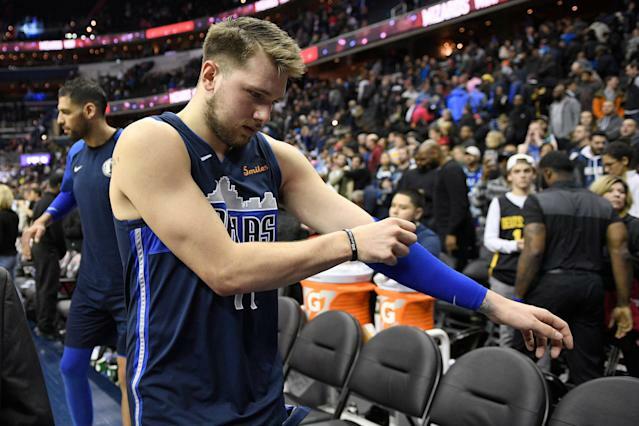 Dallas Mavericks forward Luka Doncic said he felt a “pop” in his right knee during a 94-93 loss to the Houston Rockets on Sunday, something the organization will evaluate further on Monday. Doncic, per the Dallas Morning News, said he felt “discomfort” in his right knee while grabbing an uncontested rebound. The rookie didn’t leave the game and played through the injury — which is likely a good sign for Doncic and the Mavericks. Doncic finished with a near-triple-double with 19 points, 15 rebounds and nine assists for the Mavericks in the one-point loss, their fifth straight. He’s averaged 21.2 points, 7.3 rebounds and 5.6 assists per game so far this season. Rockets point guard Chris Paul came up with the game-winning block in the final seconds on Sunday to secure the win for Houston. Down by just one point with less than 10 seconds left in the game, Jalen Brunson picked up a rebound and passed it to Doncic, who pushed the ball up the court. Doncic then got it back to Brunson, who attempted the game-winning shot before Paul shut him down. Mavericks coach Rick Carlisle had timeouts left, but he didn’t stop the game to set up a final play. That’s a fair strategy, one that has proven to be successful in the NBA. “There was not a lot of time,” Doncic told the Dallas Morning News. “I think honestly we should have called a timeout. It was the last play, and I always want to get the last shot. The 20-year-old’s strategy can work too. Neither is right or wrong. There are a lot of factors that will go into that decision, and a lot of it will come down to the coach’s preference. Brunson, even though he missed the final shot, still looked at the whole situation differently.